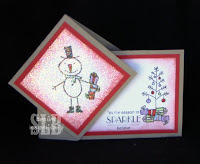 Roaming Stamper: Mr. Twigster Sparkles! Here's another great card I got in a swap! This card was made by Michelle Vernaus. I love this card because it stands up and I love having it on my desk! It makes me smile everytime I see it.